Papercrafts by Patti: Pals February Blog Hop! Hop Along! Pals February Blog Hop! Hop Along! Another month has gone by and the Pals are ready to Hop! I hope you enjoy browsing our blogs and finding new ways to create! 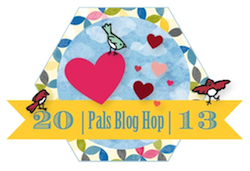 Thank you for joining us for the February Pals Blog Hop! Today the Stampin' Pretty Pals are excited to share some Valentine-themed projects made with our favorite Stampin' Up! products. I'm stop #14, so you should have come from stop #13, Rae Harper's Wild West Paper Arts. If so, you are in the right spot. If you get off track, the full blog lineup below will help you move from blog to blog so you can see all of the amazing creations. I used the frame from the Halloween Kit 2012 to make a Valentine-themed collage. The photo is from a cruise my husband and I went on years ago, but I plan to replace it with a more current photo before I reveal it to him on Valentine's Day! Hearts and Key Panel: Canvas Creations torn and embossed with the Honeycomb Embossing Folder. Fashionable Hearts Embosslits in Basic Black and Cherry Cobbler. Key from Artistic Etchings stamped in Basic Black and Basic Rhinestone added. Eiffel Tower Panel: Background is Whisper White card stock. Moon is a circle of daubed Cherry Cobbler and So Saffron ink. Image stamped in Basic Black. "Fence" edge: Glimmer Paper die cut with Snow Flurry Die, First Edition Specialty paper die cut with Tasteful Trim Bigz XL die, Cherry Cobbler die cut with Finishing Touches Edgelit. Flocked Panel: Retired Candlelight Specialty paper, retired Snow Festival paper, Basic Black card stock, Large Basic Pearl, 1/8" Basic Black taffeta ribbon. Amour Panel: Retired Snow Festival paper, First Edition Specialty paper, Basic Black die cut using the Timeless Type Sizzlits, Cherry Cobbler punched with Itty Bitty Shapes, Basic Rhinestones. Flower and Band Panel: Very Vanilla and Basic Black card stock base. Creped Filter Paper die cut using Fun Flowers Bigz Die. Flower is colored using sponge dauber and Cherry Cobbler ink. Flower center is Cherry Cobbler 1/2" Circle punch with Glimmer Brad. Band is created using Basic Black image from Artistic Etchings stamp set. Edges are punched using Scallop Trim Border punch. Decorated with Basic pearls. The next stop is #15, Maxine Conrad at Stampin' to the Max. Thank you for visiting! I hope to see you next month! Oh my gosh! This is an heirloom, Patti! I absolutely LOVE it! So creative and unique! soo romantic , love it patty !! Patti love your collage... so pretty and a beautiful keepsake. hugs. Oooo, la, la, Patti, this is a fantastic creation! Your husband will be wonderfully surprised on Valentine's Day. What a special gift. What a wonderful way to put the tray to use! Just beautiful! great attention to detail, patti. lovely photograph, too! I love collages. Yours is beautiful. So much to look at. Really beautiful! Gorgeous Patti! What a treasure! What a beautiful creation, love all the details and the lovely photo of you and your husband. Wonderful keepsake for sure!